Today, reasonably priced eggs are generally available year-round, but a hundred years ago people worried about the high price of eggs. The demand for fresh eggs is great, and so many eggs are exported, that the price is high. Twenty-five cents a dozen is a reasonable price, but this is below the average at the present date. Thirty-five cents a dozen will permit the moderate use of eggs as the main dish for breakfast or luncheon sometimes, but not a liberal use in cakes and desserts. If a recipe for soft custard calls for three eggs to a pint of milk, leave out one egg or even two, and use one or two tablespoons of cornstarch. Posted on February 17, 2016 February 8, 2016 by SherylPosted in FoodTagged eggs. I cannot imagine making custard without the full complement of eggs–I mean, isn’t that point of custard? I’m glad we never have to worry about eggs these days! I appreciate sentiment of the post, but need to comment on “why” eggs are relatively cheap now…battery cages. I have laying hens and we use their eggs, sometimes they are broody and hatch out a clutch. They all have such unique personalities that I cannot imagine how stressed and deprived they would be if they had to live in a commercial egg house in battery cages with only enough room the size of a typical piece of writing paper. I agree with your comment as I also have a backyard flock of chickens. Factory farming is a tragedy on many levels. My heart breaks for those poor animals. Not all of us can have hens in the garden, but it’s not that difficult to buy humanely raised eggs everywhere. They are more expensive, but that’s a price I am very willing to pay. 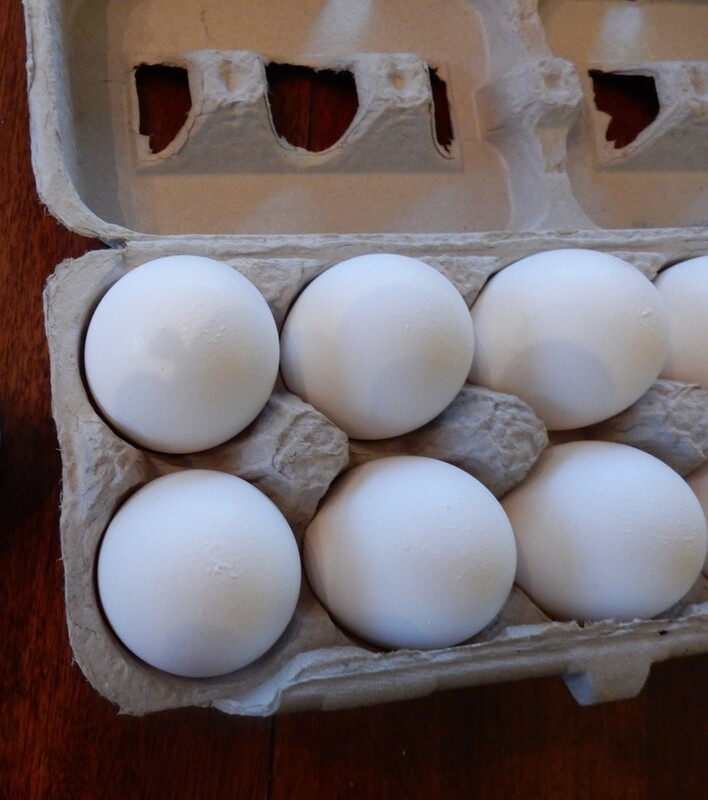 Farmer’s Markets around here have organic free-range eggs. Here as well, though most don’t operate year-round. But such eggs are available in most supermarket so it’s not an effort to get them. Here there are some indoors ones during the winter. They have eggs year-round, though the selection of vegetables gets extremely limited during the winter. You are so fortunate. I wish that I could have a backyard flock. I really enjoy having chickens. I love their personalities, and of course, the fresh eggs are wonderful. The great news is that more and more neighborhoods are allowing small backyard flocks. How true–food production sure has become industrialized over the years. It’s wonderful that you are able to raise chickens. Chickens are a lot of fun! Such an interesting flash back and a reminder of when we were closer to our food, bought in season and had to deal with these real situations. A reminder too of our dependence today on factory farming with its dark side. It’s sad how far we’ve generally gotten from “real” food. I read somewhere that mashed pear can be used as an egg substitute as it helps keep things together. Interesting–that’s a new one for me. It would be interesting to experiment with using mashed pears. Wow, food sounds like it was expensive in Alaska. The eggs were more than twice as much as in the lower 48. From what I’ve read, the cost of living there now is still high. This is good to know. I never would have thought of substituting milk and corn starch for eggs. I hate to have to run out and get an ingredient if I discover I’m out of something in the middle of a recipe, and will substitute whenever possible. Isn’t this advice useful on a recurring basis? Every once in a while the price of eggs goes up so that you don’t want to use them with abandon. As for the idea of ditching desserts, I might just go and eat a spoonful of sugar in protest! Wish we had these prices today for our eggs – maybe we will get lucky and have the eggs go down in price like our gasoline at the moment. Old articles that include prices make me acutely aware of how much inflation there has been over the years. Our family always had chickens when I was growing up. My sister and husband still raise them on the home place and gave us three dozen when we visited them last weekend so I can splurge on baking. With the price of eggs now, one uses them carefully. Interesting substitutions. It’s nice to hear that you enjoyed it. Times sure have changed. Food expenditures have become a much smaller percentage of household expenses over the past hundred years–but there are also costs associated with it. Farming has become much more industrialized; food is much more processed, etc. I just bought eggs today and though how they are one of the least expensive forms of protein in our diets. I’ve also heard that eggs are a cheap source of high-quality protein. I’m paying $6/dozen for mine now, but they come from a farm where they live a truly free-range life. Beyond that, their taste is wonderful, and since I only use a dozen every couple of weeks, it’s worth it. After all, the cost of a dozen organic eggs is no more than a Starbucks grande-whatever. I’ll support my farmers, and cut elsewhere. That said, it’s nice to have another tip to tuck in my book of tricks. And here’s an interesting article you might enjoy, from The Paris Review: Favorite Recipes of Famous Women. Nice comparison of the cost of eggs vs. Starbucks grande. It makes is very obvious how inexpensive even “expensive” eggs really are. I guess not everyone had their own chickens years ago like my mom’s family did! My grandmother even sold eggs for extra money. This brings me back to stories my mother told me of her youth in the 1920s on a farm here in Ireland. Selling eggs was a big thing for a liitle girl. It’s nice to hear that it brought back memories of stories your mother told. My older recipe books use butter, sugar and eggs very sparingly. The cakes and biscuits are every bit as good as the more modern recipes. Custard, when I was younger, was only made with custard powder or a combination of custard powder, cornstarch and one egg. I also like the old recipes. 🙂 . Great reminder of how lucky we are to live in a time and place when we don’t suffer from food shortages, and when the most basic ingredients are within the reach of most people’s budgets! Based on what I’ve seen in old magazines and books, my sense is that most people spent a relatively higher percentage of their income on food back then than what they do now. We take so many things for granted – eggs are a staple for most if not every household. The way things are going we should save your helpful hints we may need to use some day. Great ideas but you would have thought that they would have their own chickens, right? Or was it to be too expensive to buy them & feed them? A lot more people lived on farms back then than now–but many lived in towns and cities. Your comment sent me searching for the percentage of the population on farms back then. According to a New York Times article about 32% of the US population lived on farms in 1916. I LOVE your blog. 🙂 What a great post. My grandparents were born in 1919 and I love history. So glad I stumbled onto your blog. It wonderful to hear that you like A Hundred Years Ago. I also love history, and really enjoy thinking about the differences (and similarities) across the years.